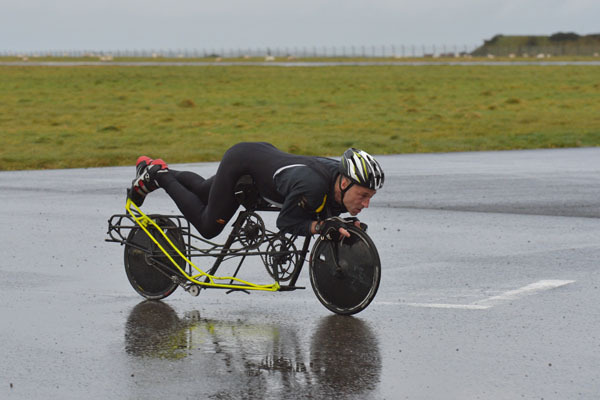 Following my last trip to see Graeme Obree gliding down a quiet Saltcoats street on his HPV, I was keen to see how ‘The Beastie’ had progressed. 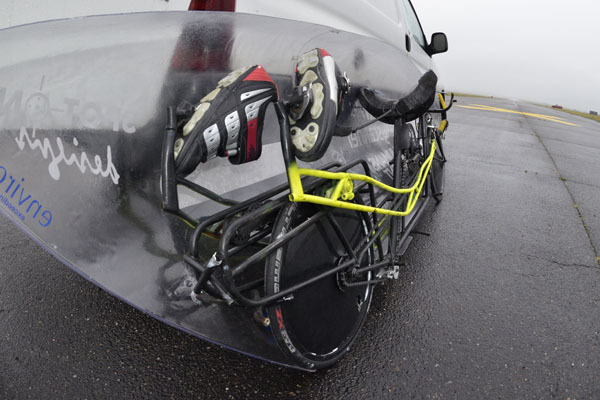 Graeme had hoped to test his build at the highest level at the Battle Mountain HPV World Championships in September, however difficulties with the fabrication of the fairing meant that the attempt had to shelved until next year. 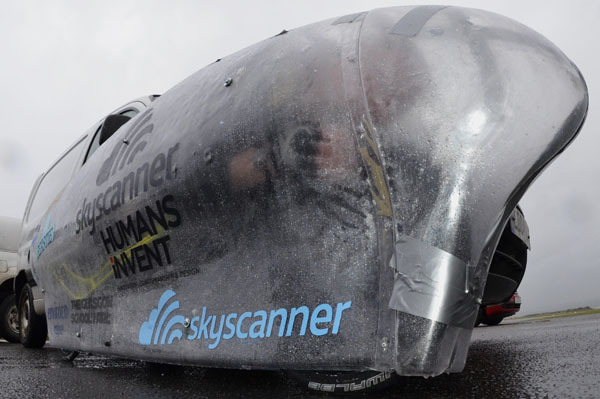 With the ‘real’ fairing still being fabricated, the test run would be with a temporary shell. The isolated former High Security US Navy / MOD base at Machrihanish near Campbeltown was the perfect place for a test run with a nearly 2 mile long runway. 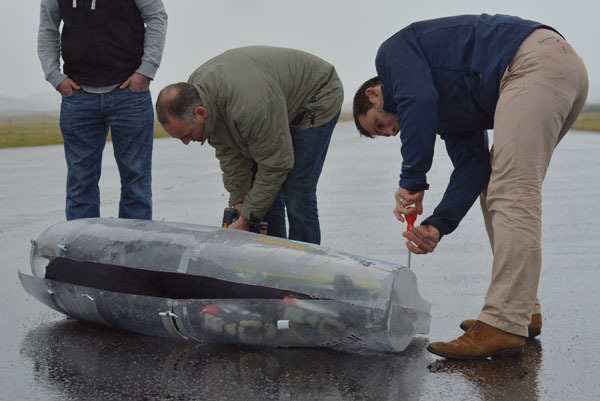 Unfortunately the weather didn’t go to forecast and gusty crosswinds and constant rain put the test run in doubt. “Ah, let’s give it a go,” said Graeme, and it was on. 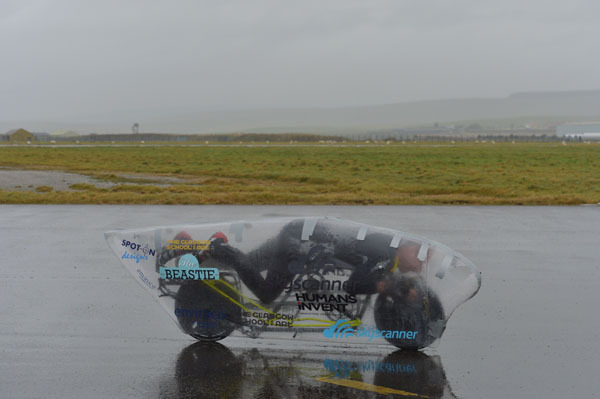 The rain added a whole new set of challenges for the test run, the main one being the fogging up of the clear fairing; a makeshift hole cut in the front gave Graeme a small window. 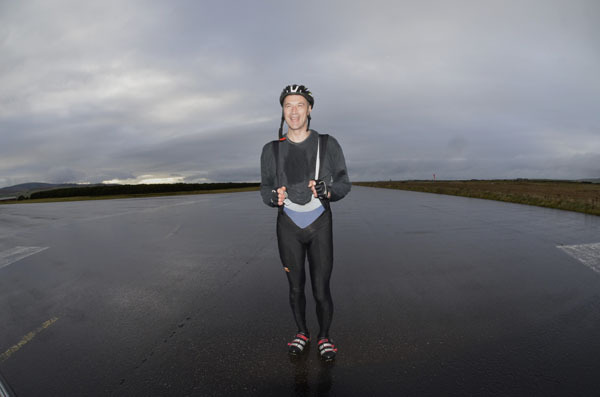 With the wind gusting, Graeme was pushed away from the west end of the runway but difficulties seeing where he was heading lead to a premature halt in the first test run. “I could see the grass at the edge of the runway getting nearer then I would swerve away – it was very difficult looking out of the window on the side, also the spray kicking up off the wheels inside the fairing and running down the inside” Graeme continued, “But, we know it goes, it’s very manoeuvrable and I can virtually come to a stop before falling to the side. The fairing was stripped off and Graeme took to the runway again. On this run Graeme looked very smooth, rolling past me at a decent speed before I jumped into my car and followed down the wet runway at around 40mph despite less than ideal conditions.